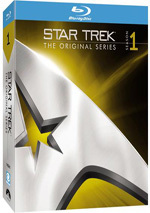 Director J.J. Abrams’ global sensations Star Trek and Star Trek Into Darkness set a course for the ultimate comprehensive home entertainment package in Star Trek: The Compendium. Packed with previously released Bonus Material and additional Never-Before-Seen Footage, this collection is the definitive resource for the Star Trek aficionado. With a 2014 Blu-ray package called The Compendium, fans of the recent Star Trek “reboot” can gather both films to date in one place. The four-disc set gives us 2009’s Star Trek and 2013’s Star Trek Into Darkness. Since I reviewed them individually in the past, I’ll not repeat all of my movie-related comments here. I’ll throw in summaries of my opinions but if you want to read my complete thoughts, you can go here for Star Trek and head here for Into Darkness. I can’t deny Trek is a blast to watch. It’s a wild adventure with a great deal of enjoyable material. I simply remain a little stuck on my perception that it may be a fun sci-fi action flick but it just ain’t Star Trek. If that doesn’t bother you, you’ll probably love it. If it does trouble you… well, you’ll still like it, but you may find yourself with less enthusiasm about it. Star Trek appears in an aspect ratio of approximately 2.35:1 on this Blu-Ray Disc. Virtually no problems emerged during this strong presentation. Sharpness consistently looked solid. The vast majority of the film offered excellent delineation, with only a few slightly iffy shots on display. Those were exceedingly infrequent, as the movie usually seemed tight and concise. I noticed no issues with shimmering or jaggies. Both edge haloes and source flaws were also absent. Within its stylized palette, no dominant colors emerged, as the hues varied quite a lot through a mix of settings. For instance, the Romulan ship came bathed in sickly greens, while the Enterprise was more of a bright, white place. The tones looked good and came across as intended. Blacks appeared dark and dense, while shadows were smooth and well-developed. This was a fine presentation. Similar praise greeted the Dolby TrueHD 5.1 soundtrack of Star Trek. With a lot of action on display, the mix boasted multiple opportunities for involving material, and it took advantage of these. Of course, the big space battles used the soundscape the best, as those became vivid and involving. Crafts, explosions, and weaponry zipped around the room to form a terrific sense of the action. Audio quality was also more than satisfactory. Speech was natural and concise, with no edginess or other issues to detract. Music appeared lively and full, and effects worked spectacularly well. They always sounded vivid and dynamic, with clean highs and some serious bass. This was a very positive soundtrack. How did the 2014 Blu-ray compare to the 2009 release? Both were identical – literally. The 2014 simply replicated the Blu-ray from 2009. That meant the Compendium version came with the same extras, of course. 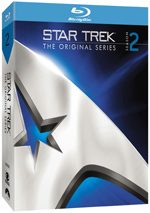 Star Trek includes an audio commentary from director JJ Abrams, executive producer Brian Burk, producer Damon Lindelof and writers Roberto Orci and Alex Kurtzman. All sit together for a running, screen-specific look at cast/characters/performances, set and visual design, music and audio, effects, costumes and makeup, script/story areas, deleted/altered sequences, “rebooting” the franchise and dealing with Trek canon, and other influences. Despite a lot of happy talk – evident by frequent remarks about how the participants love this or that about the film – we get a good examination of the flick. The commentary definitely covers a wide array of subjects, and I especially like the focus on screenplay, plot and character issues. I could live without all the self-praise, but there’s more than enough useful content to make this a solid chat. A few ads open Disc One. We get clips for Transformers: Revenge of the Fallen, GI Joe: The Rise of COBRA, Fringe and the Star Trek: D-A-C videogame. Over on Disc Two, most of the content comes in the form of featurettes. Many of these include optional branching content. When activated, these “pods” split off from the main program and offer additional info. First comes the 16-minute and 41-second To Boldly Go. It offers notes from Abrams, Orci, Kurtzman, Lindelof, Burk, and actor Leonard Nimoy. They discuss some issues with the reboot and the story. A few new tidbits emerge, but I feel like most of this already appears in the commentary. It’s still a good featurette; it just feels a bit redundant. I do like the shot in which Nimoy tells new Spock Zachary Quinto that he’s stuck with Trek for life; he laughs as he tells Quinto “you’re screwed”, but you know he kinda means it. “Boldly” comes with four branching pods: “The Shatner Conundrum” (1:58), “Red Shirt Guy” (0:43), “The Green Girl” (3:25), and “Trekker Alert!” (2:22). “Shirt” is just a silly piece of fluff, but “Girl” is a good look behind the scenes; it shows how the makeup folks transformed actor Rachel Nichols. “Conundrum” gives us thoughts about why Shatner didn’t appear in the film, while “Alert!” shows some Trekkies on the set. Actors come to the fore in Casting. This show runs 28 minutes, 53 seconds and features Abrams, Burk, Orci, Nimoy, Kurtzman, original castmember Nichelle Nichols, 1st AD Tommy Gormley, and actors Chris Pine, Zachary Quinto, Karl Urban, John Cho, Zoë Saldana, Bruce Greenwood, Anton Yelchin, Eric Bana, and Simon Pegg. We learn about the cast and what they brought to their characters. A fair amount of praise emerges here, but more than enough good content compensate. We find some decent insights into the casting process, and a lot of behind the scenes footage adds impact. After this comes the 19-minute, 31-second A New Vision. It offers statements from Abrams, Burk, Orci, Kurtzman, Gormley, Nimoy, Pine, Urban, Saldana, Quinto, production designer Scott Chambliss, executive producer Jeffrey Chernov, visual effects supervisor/2nd unit director Roger Guyett, director of photography Dan Mindel, ILM visual effects supervisor Russell Earl, and ILM animation supervisor Paul Kavanagh. “Vision” gets into the film’s tone and inspirations as well as various visuals aspects like photography, locations, and effects. In the latter area, practical effects come to the fore, and those offer some of the most interesting aspects of the piece; it’s fun to see the old-fashioned methods used in the flick. In the next few programs, we dig into technical areas. Starships fills 24 minutes, 33 seconds with info from Abrams, Nimoy, Chambliss, Burk, Guyett, Earl, Kavanagh, Pegg, Chernov, Pine, Urban, Kurtzman, Yelchin, Saldana, Cho, Orci, Bana, supervising location manager Becky Brake, visual effects art director Alex Jaeger, digital model supervisor Bruce Holcomb, digital models and simulation John Goodson, Viewpoint supervisor Russell Woodall, and actors Faran Tahir and Jennifer Morrison. As expected, this show looks at the design and execution of the movie’s starships. We get a good mix of facts about locations, effects, and other techniques used to create the variety of vehicles. I especially like the discussion of the new Enterprise’s bridge design. Seven “Branching Pods” appear with “Starships”. We find “Warp Explained” (1:22), “Paint Job” (1:14), “Bridge Construction Accelerated” (1:17), “The Captain’s Chair” (0:45), “Button Acting 101” (1:44), “Narada Construction Accelerated” (1:20) and “Shuttle Shuffle” (1:46). The two “Acceleration” clips are interesting since they show time-lapse glimpses of set creation. The other bits offer decent thoughts, though they tend to remain insubstantial. I do like “Acting”, as it discusses the goofiness of pretending to fly starships. During the 16-minute, 29-second Aliens, we hear from Guyett, Pegg, Nimoy, Quinto, Bana, Kurtzman, Kavanagh, Delta Vega creatures, Romulans, insect and aliens designer Neville Page, Vulcans and Romulans creator Joel Harlow, and aliens designer and creator Barney Burman. Once again, we find a featurette with a self-explanatory title. This one examines the design and execution of the movie’s alien races. We learn about makeup, prosthetics, costumes and effects used to bring these characters to life. I’d like a little more about the more obscure species – Vilcans and Romulans dominate – but we still find lots of nice info here. In particular, it’s cool to hear Nimoy critique Vulcan ears. Five “Branching Pods” accompany “Aliens”. We locate “The Alien Paradox” (1:40), “Big-Eyed Girl” (1:25), “Big Bro Quinto” (1:26), “Klingons” (1:57) and “Drakoulias Anatomy 101” (1:35). All offer interesting tidbits, though I especially like “Klingons” since it’s our only glimpse at those characters, as the final film omits them. Planets goes for 16 minutes, 10 seconds, and features Chambliss, Quinto, Brake, Guyett, Earl, Burk, Pine, Cho, Chernov, assistant location manager Kathy McCurdy and special effects supervisor Burt Dalton. The program examines locations and attempts to create alien worlds as well as a futuristic Earth. By this point, we know what to expect from these featurettes, and “Planets” delivers another informative program. It gives us good details and fleshes out the techniques well. This area offers two “Branching Pods”. We get “Extra Business” (2:29) and “Confidentiality” (2:45). “Business” looks at the work of extras on the set, while “Confidentiality” examines efforts to ensure that info about the film didn’t emerge. Both are good, though I particularly like the borderline paranoia necessary to keep Internet nerds from exposing everything about the flick in advance. With the nine-minute, 22-second Props and Costumes, we locate details from Burk, Abrams, Kurtzman, Orci, Saldana, property master Russell Bobbitt, and costume designer Michael Kaplan. The show examines communicators, phasers, tricorders, ear pieces, and different outfits. All the material works, especially when the participants discuss attempts to remain fairly true to TOS designs. Audio dominates in Ben Burtt and the Sounds of Star Trek. It goes for 11 minutes, 45 seconds as we hear from special effects and montage sound designer Burtt. He talks about the audio used in the original series and lets us know what he did to update those elements. Burtt is pretty much the best in the business, and it’s always fascinating to hear him get into his work. Finally, Gene Roddenberry’s Vision lasts eight minutes, 47 seconds. It features Nimoy, Abrams, Orci, Kurtzman, Lindelof, Trek graphic designers/historians Denise and Michael Okuda, science consultant Carolyn Porco, Trek producer Rick Berman, filmmaker Nicholas Meyer, and Enterprise executive producer Manny Coto. The participants discuss the era in which Roddenberry came up with “The Original Series” and looks at his goals/work for the series. While I obviously respect Roddenberry’s legacy, “Vision” gives us a pretty generic take. We don’t really learn much about Roddenberry and generally get bland thoughts here. Most deleted scenes are inconsequential trims, and that’s true of some of these clips. However, the Trek cut sequences prove to be much more interesting than most. We find an entire deleted subplot that involved Klingons, and we watch more of Kirk and Spock as kids. Expect to find a lot of fun bits among this intriguing collection of segments; they hint at different directions the film might’ve taken. An interactive component arrives via the Starfleet Vessel Simulator. This allows you to check out details of the Enterprise and the Narada. Via these, you can inspect the ships from various angles and read text notes about their components. This turns into a good way to learn more about the two vessels. Overall, I like Darkness, and I must give the film credit for its basic popcorn appeal. It also holds up well to repeated viewings; the original Blu-ray represented my third screening of the flick over barely three months, and it continued to entertain. I don’t think it equals the pleasures of the 2009 Trek and I actively dislike some of its choices, but Darkness presents enough fun to become a good continuation of the series. Star Trek Into Darkness appears in an aspect ratio of approximately 2.40:1 on this Blu-Ray Disc - usually. The filmmakers shot about 30 minutes of the movie with IMAX cameras, and that used a ratio around 1.43:1. For those scenes, the Blu-ray expanded to 1.78:1; it’s not the full IMAX image, but it’s closer than 2.40:1. At all times, sharpness delivered strong images. Virtually no signs of softness arose here, as the movie remained crisp and tight even in the widest shots. Jagged edges and moiré effects didn’t occur, and the movie lacked edge haloes or other distractions like print flaws; it was always clean. Expect a heavily teal palette here. A few earthier tones occasionally occurred – like some prominent reds – but the chilly blues dominated. However one feels about those choices, the disc reproduced them in a positive fashion. Blacks were tight and rich, and low-light shots offered smooth, well-defined elements. Everything here soared and gave us a terrific transfer. The comments above reflected my thoughts about the original Blu-ray – did matters change with the 30 minutes or so of IMAX footage? Yup, as I thought the IMAX material looked even stronger than the 2.40:1 footage. The IMAX shots boasted stunning clarity and vivacity; they truly leaped off the screen. Since almost one-fourth of the film offered flawless visuals, why didn’t I change my original image rating? Because an alteration of my grade would require a push to “A+” and I didn’t feel comfortable with that since more than 75 percent of the movie didn’t live up to the IMAX material. Nonetheless, this became a terrific presentation that really excelled when those IMAX moments occurred. We get ample pleasures from the thrilling Dolby TrueHD 7.1 soundtrack of Darkness. A sci-fi flick that didn’t skimp on action, the mix made vivid use of all available speakers to create an involving, immersive experience. With lots of battles and space components, the information popped up in logical places, meshed together smoothly and created a wonderful sense of the situations. The soundscape was consistently an active presence and really brought us into the story. In addition, audio quality excelled. Speech was natural and distinctive, while music sounded robust and full. Effects did the heavy lifting and added real punch to the package; with clean highs and deep lows, those elements sounded great. I couldn’t have asked much more from this impressive soundtrack. How did the 2014 Blu-ray compare to the original release from 2013? Audio remained identical, but the addition of the IMAX footage for about 30 minutes of the film meant a visual upgrade. This may have occurred for less than 25 percent of the film, but those moments offered a real treat. While the extras for Star Trek simply repeat the components from the 2009 package, Into Darkness comes with a much larger roster of bonus materials than found on the 2013 set. I’ll mark new materials with blue print. On Disc One, we get an enhanced commentary. This combines picture-in-picture capabilities with a varying roster of participants. These split into nine chapters with a total running time of two hours, 42 minutes and 46 seconds. “An Island Adventure” (16:39): visual effects supervisor/2nd unit director Roger Guyett and co-producer/unit production manager Tommy Harper discuss alien character design, various effects and sets/locations. “Mystery Visitor in London” (2:28): composer Michael Giacchino talks about the score and changes made to his original cues. “Tragedy & Mystery” (42:25): editors Maryann Brandon and Mary Jo Markey cover story/script/character areas, cast and performances, editing, deleted scenes and reshoots. “The Kronos Battle” (9:51): director of photography Dan Mindel and 2nd unit director of photography Bruce McCleery get into camerawork, lighting and other technical areas. “Enemy in the Brig” (15:25): composer Michael Giacchino tells us more about his music, with an emphasis on Khan’s theme. “Ship to Ship” (21:41): director JJ Abrams offers general thoughts about the film’s creation that spotlight the elements required for the scene in question. “Fall of the Enterprise” (17:23): producer Bryan Burk and writer/producer Damon Lindelof go over story/character elements, the rationale for the film’s use of Khan, and other filmmaking choices. “San Francisco Finale” (15:19): director JJ Abrams gives notes about IMAX photography, effects, stunts, cast and performances, and sets and locations. “The Captain’s Oath” (11:35): composer Michael Giacchino finishes with additional notes about music and the use of the original Trek theme. In addition to the commentary voiceovers, the picture-in-picture side delivers footage from the shoot and other background elements. The piece also allows the participants to freeze the image to spotlight various elements; they can use telestrator capabilities to circle/highlight different bits as well. While interesting in theory, the various visual elements don’t add a lot to the package. Occasionally they let us better understand details but these moments don’t add up to a lot of worthwhile pieces. As for the commentaries themselves, they tend to be up and down. The best chats come from the editors and from Abrams, while some of the others tend to be a little dry and technical. In addition, Burk and Lindelof joke too much, and a fair amount of dead air occurs at times; this becomes a particular problem after the Mindel/McCleery chat as well as before/after some of Giacchino’s moments. Even with some flaws, though, I think the “enhanced commentary” becomes worthwhile. It covers a lot of topics and delivers a nice array of insights. While I suspect it would’ve worked better as a more traditional commentary, it remains a mostly compelling compilation. On Disc Two, we locate a series of 21 featurettes. Via a “Play All” option, these run a total of two hours, two minutes, 14 seconds. We find The Mission Begins… Again (2:28), “Creating the Red Planet (8:28), Introducing the Villain (2:16), Rebuilding the Enterprise (5:31), National Ignition Facility Home of the Core (4:32), “Attack on Starfleet” (5:25), Aliens Encountered (6:54), “The Klingon Home World” (7:30), “The Enemy of My Enemy” (7:03), Vengeance Is Coming (4:28), “Ship to Ship” (6:03), Mr. Spock and Mr. Spock (4:08), Down With the Ship (6:09), Kirk and Spock (5:36), “Brawl By the Bay” (5:44), Fitting the Future (5:03), Property of Starfleet (4:53), Unlocking the Cut (5:10), Visual Affection (9:03), The Sound of Music (And FX) (5:26), Safety First (2:27) and “Continuing the Mission” (1:57). Across these, we hear from director/producer JJ Abrams, executive producer Jeffrey Chernov, greens gang boss Roger Prater, art director Lauren Polizzi, creature designer Neville Page, unit production manager/co-producer Tommy Harper, pyro forepersons Anthony Simonaitis and William Aldridge, first assistant photographer Serge Nofield, costume designer Michael Kaplan, stuntmen Mike Massa and Daniel Stevens, electrical engineer Arnold E. Peterson, producer Bryan Burk, production designer Scott Chambliss, visual effects supervisor/second unit director Roger Guyett, dimmer operator Joshua Thatcher, art director Andrew EW Murdock, makeup effects artists Barney Burman andJamie Kelman, language consultant Britton Watkins, consultant Marc Okrand, writers/producers Damon Lindelof, Roberto Orci and Alex Kurtzman, previs and postvis supervisor Bradley Alexander, VFX producer Ron Ames, first AD Tommy Gormley, fight choreographer Marcus Young, NIF principal associate director Ed Moses, assistant location manager Kathy McCurdy, art director Jason Stewart, electrical engineer Arnold E. Peterson, special makeup effects artists Lance Anderson, Heather Langenkamp and Will Alvin, makeup sculptor Glen Eisner, hair department head Mary Mastro, visual effects art director James Clyne, makeup department lead David Anderson, 2nd unit director of photography Bruce McCleery, visual effects/editorial Adam Gerstal, prop master Andy Siegel, props department Melissa Harrison, assistant editor Robert Stambler, first assistant editor Julian Smirke and Rita DeSilva, editors Mary Jo Markey and Maryann Brandon, supervising sound editor Matthew Wood, art department Amelia Brooke, ILM compositing supervisor Jay Cooper, ILM CG supervisor Daniel Pearson, ILM animation supervisor Paul Kavanagh, compositor Bryan Begun, ILM digital matte supervisor Barry Williams, composer Michael Giacchino, orchestrator/conductor Tim Simonec, supervising sound editor/sound designer Ben Burtt, and actors Karl Urban, Jeremy Raymond, Zachary Quinto, Bruce Greenwood, Chris Pike, Zoe Saldana, Anton Yelchin, Noel Clarke, Sean Blakemore, Benedict Cumberbatch, Simon Pegg, Kimberly Broumand, April Marie Eden, Deep Roy, Leonard Nimoy, John Cho, and Peter Weller. These cover sequel-related challenges, story/character areas, sets and locations, creature, costume and art design, various effects, camerawork, cast and performances, stunts and action, makeup, editing, music and audio, and some other topics. When I reviewed the original Blu-ray, I indicated that I liked the collection of featurettes but thought they seemed a little on the skimpy side. I can’t make that complaint now, as the nearly two hours of material covers a broad array of subjects. These offer a strong examination of the movie’s creation. Seven Deleted Scenes fill a total of five minutes, 26 seconds. We find “Nibiru Captain’s Log” (0:46), “Marcus’ Office (Alternate Version)” (0:48), “Room Attack (Alternate Version)” (0:50), “Carol’s Accent” (0:23), “Klingon Conversation (Alternate Version)” (1:20), “Scotty Cargo Bay Door” (0:49) and “Kirk Meets Girl” (0:22). To call the added footage insubstantial would be an understatement, as nothing here offers anything important. That said, the clips give us entertainment value, especially when we get to see the fabricated captain’s log Spock mentions in the theatrical cut. We also find out what became of the little girl near death early in the film. These bits become fun to see but they don’t expand the story in a notable manner. In addition to three trailers for Into Darkness, we see a Gag Reel (5:48). Should you expect anything other than goofs and giggles? Nope. Two movies into the franchise and I remain a fan of the Star Trek “reboot”. Both 2009’s Star Trek and 2013’s Into Darkness bring us fun, lively adventures that hold up to repeated viewings. As bundled in The Compendium, the Blu-rays present the films with excellent picture, audio and bonus materials. 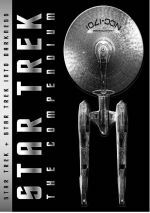 Considered on its own, Star Trek: The Compendium gives us a fine package, but it becomes a more questionable purchase for fans who already own one – or both – of the prior Blu-rays. Star Trek comes with no changes from the original Blu-ray, but Into Darkness offers improved visuals and a vastly expanded set of supplements. Again, if you don’t possess the prior releases, The Compendium turns into the way to go, but with a list price of $44.99, it’s a more difficult sell to fans who have one or both of the earlier packages. The upgrades for Into Darkness give us a compelling selling point but probably aren’t enough to justify a purchase on their own.